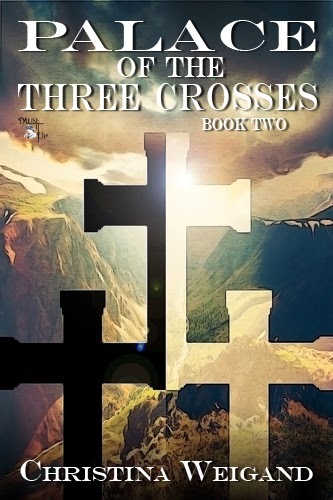 Welcome to Palace this post of the Three Crosses book tour! :) This post was supposed to be posted a bit earlier but I was having a few problems with blogger, but thankfully that is all fixed now. So sorry this is late but here you go. :) Enjoy! It includes a spotlight, interview, and excerpt. When I was in middle school I started writing. Hard question to answer. I credit God with most of my inspiration. If he didn’t plant the ideas through my life experiences, the books I read, my family, movies, I guess basically anything that comes across my path can serve as inspiration. Do you have a special playlist that you listen to while writing? Sometimes I listen to Christian music, but most of the time I don’t listen to any music. Is there a particular other that you look up to? The writers in my old critique group and writer’s group. They are some wonderful men and women, some published, some not, but all dedicated to writing and helping others. Have you ever thought about turning your books into movies or graphic novels? I’m just happy that they are being published, although at times I have entertained the idea of the trilogy being made into a movie. I have trouble visualizing it as a graphic novel. I wrote when I was in high school but upon graduation set it aside to get married and raise a family. About twelve years ago after my fourth child was born and I felt god pulling me in a different direction than I was headed, I started writing again. What are your thoughts on pen names? Never really thought about it. I guess If I ever chose to write in another Genre that was so different from what I currently write then I might consider using one. What's the craziest thing you've ever done and why? Six years ago my husband and I decided to leave our home in PA where we had been all of our lives and move to the lovely state of Washington. We moved so my husband could take a job, but the crazy part we had literally lived in Pennsylvania all of our lives. We were born there, grew up there, got married and raised our first three kids there. We decided it was time for a little adventure and adventure was what we had. Do you have any advice for those who plan on becoming a writer some day? Don’t give up and write, read and write some more.